My wife Fern, my daughter Danielle and I were amazed how different life is approximately one hour away from Las Vegas – in any direction. Even when were still able to view the bright lights of the Las Vegas strip in the distance, we entered into a totally different world with beautiful natural scenery and marvelous man made wonders! 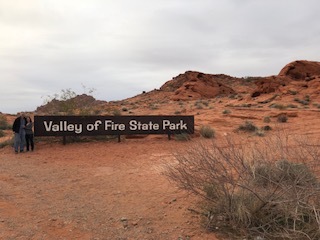 Nevada’s striking scenic recreational areas were the perfect relaxing antidote after our over stimulation from the sounds and sites of Las Vegas. Hoover Dam: Less than one hour from the City of Lights, the Depression era Hoover Dam controls the flow of the Colorado River. Completed in 1935, this world renowned structure is listed as one of American’s modern civil engineering wonders. Walking across the O’Callaghan – Tillman Bridge (opened in 2010), Danielle, Fern and I were provided with dramatic views of the dam and river. 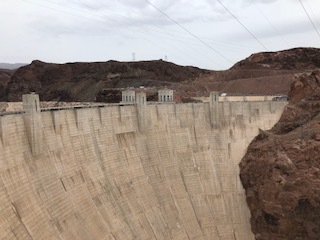 The bridge’s six foot wide pedestrian sideway allows visitors to walk from the Nevada side of the dam to just over the Arizona border, where the path ends. Fern and I found the Las Vegas strip and its casinos to be extremely crowded and smoky. Nevertheless, during our time within Las Vegas, we particular enjoyed the following activities. Vegas, the Show: Told in a splashy style, Vegas is a musical showcasing the history of Las Vegas. The show pays homage to big name Vegas entertainers (such as Elvis, Tina Turner and the Rat Pack) and features Las Vegas showgirls donned in rhinestones and feathers. Most nights, the show is performed at 7 and 9 p.m. in the Planet Hollywood Casino’s Saxe Theatre. Purple Reign, The Prince Tribute Show: Jason Tenner does an exceptional job taking on the look, sound and moves of Prince. Starting at 9 p.m. in the Tropicana Hotel, the show lasts just under two hours. The show features high energy dancing, focusing on the hits from the movie Purple Rain. Marriage Can Be Murder: For the last 18 years, this interactive comic murder mystery dinner theater allows participants to try to solve the case. Beginning at 6:30 p.m. and lasting for two hours in the D Las Vegas Hotel near downtown, the evening was just plain fun. The three course dinner was pretty bland, but we did have vegetarian and chicken options. Big Elvis: Performing three days per week inside a piano bar within Harrah’s Casino, Pete Vallee may be the world’s biggest Elvis impersonator. Pete really does sound like Elvis, but he is much heavier than Elvis ever became. Pete claims to be a love child of Elvis! Spectacles of the Strip: Our favorites were watching the dancing fountains in front of the Bellagio, set to lights and different music throughout the evening (on the quarter hour), watching the 50 foot high volcano erupt in front of the Mirage (twice nightly) and observing the fall of Atlantis animated show inside Caesar’s Palace with fire, water and nine foot tall talking statutes (on the hour). Eating at Carmine’s Restaurant: Within Caesar’s Palace, this southern Italian restaurant features hearty family style portions. Set it a multi-level dining room, the servers were extremely responsive and the taste of the food – the bread, the pasta, the sauces and the eggplant – was incredibly delicious. As a result, upon our return to Washington, D.C., we ate at Carmine’s sister restaurant in Penn Quarter. The Mob Museum: Located downtown, several friends had recommended this attraction to us. We found the museum to be a pretty static and boring experience, where primarily we reading exhibit after exhibit about organized crime and its impact on American society. Most of the interactive features required extra fees. The Deuce Bus: The double decker bus may be the cheapest way to travel along the strip, but the ride was far from comfortable. We crawled along in traffic, with frequent stops to pick up noisy and rowdy passengers. The Freemont Street Experience: This five block stretch downtown becomes hyper active at night. Underneath a canopy, the pedestrian style mall provides for a blitz of ear splitting sound, intense neon lights and a constant barrage of drunken pedestrians wandering from casino to casino. The Lack of Amenities in Hotel Rooms: Many Las Vegas hotel rooms do not have refrigerators or coffee makers. As a result, we could not store food in our room and had to go out to get coffee every morning. So, as we were leaving the glitz of Las Vegas, with lights so bright every night, Danielle, Fern and I were most happy to recall the breathtaking parklands and natural areas just one hour away from the strip.